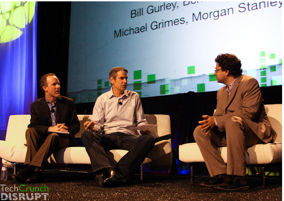 Today, at TechCrunch Disrupt, Erick Schonfeld sat down with Bill Gurley, partner at Benchmark Capital and and Michael Grimes, Managing Director and Co-Head of Global Technology Investment Banking at Morgan Stanley, to discuss the current IPO market. As Facebook, LinkedIn, Jive and Millennial Media consider taking their companies public over the next few years, GreenDot, an under the radar startup is filing for a $2 billion IPO today. When asked what will be the one IPO that will change the current market, Gurley said that he didn’t believe that their would be one single public offering that would shake the market and influence other companies. Many companies, of course, are waiting for profitability before going public. Gurley says that a company can also enter the process without profitability but needs to be every convincing.For example, Salesforce wasn’t profitable at the time of their IPO, says Gurley, but co-founder Marc Benioff made a compelling case that the company would be profitable in the near fture. Grimes adds that more isn’t necessarily better when it comes to revenue. He says that a $50 million run rate could work better than a $100 million run rate depending on the business model. Gurley doesn’t seem to think there is a need for a super high-quality company to go public to open up the IPO floodgate. As he told the audience, LinkedIn has brought on public company veteran Skip Battle as a board member, signaling that the professional social network is prepping for an IPO in the next year. And Skype filed a registration to take the VoIP company public a few months ago. Facebook is looking to IPO in 2012 at the earliest but Gurley said that with 500 million users Facebook could go public at a cattle auction. Gurley and Grimes also highlighted the fact that companies based outside of Silicon Valley, such as Greendot, are going public but don’t get as much attention as those in the Valley. So what’s the reasoning behind taking a company public? Grimes says that the liquidity for founders and employees, increased capital for M&A as well as additional exposure to a brand are all positive results of an IPO. Both Grimes and Gurley expect 40 to 50 companies to IPO in the tech space over the next year, including Skype and LinkedIn.